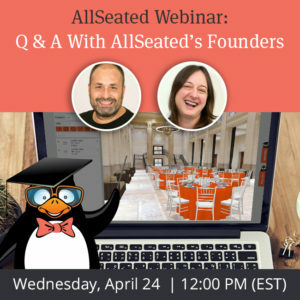 AllSeated, Inc. (“AllSeated”) respects the intellectual property rights of others and expects its users to do the same. It is AllSeated’s policy, in appropriate circumstances and at its discretion, to disable and/or terminate the accounts of users who repeatedly infringe the copyrights of others. In accordance with the Digital Millennium Copyright Act of 1998, the text of which may be found on the U.S. Copyright Office website at http://www.copyright.gov/legislation/dmca.pdf, AllSeated will respond expeditiously to claims of copyright infringement committed using the AllSeated website or other online network accessible through a mobile device or other type of device (the “Sites”) that are reported to AllSeated’s Designated Copyright Agent, identified in the sample notice below. If you are a copyright owner, or are authorized to act on behalf of one, or authorized to act under any exclusive right under copyright, please report alleged copyright infringements taking place on or through the Sites by completing the following DMCA Notice of Alleged Infringement and delivering it to AllSeated’s Designated Copyright Agent. Upon receipt of the Notice as described below, AllSeated will take whatever action, in its sole discretion, it deems appropriate, including removal of the challenged material from the Sites.